From eBay seller hooksy2012. 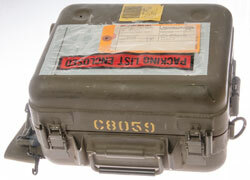 This is part of my interest in military audio equipment, see Related below. This unit is for testing parts of the Digital Group Multiplexers (DGM, 500 pages, COU Chapt. 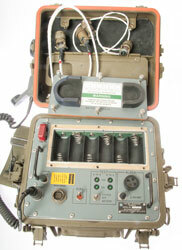 13, but earlier version) system by Raytheon. The backbone of the system is the CX-11230 twin coaxial cable that coes in 100 foot and 1/4 mile spools [TM 11-5995-208-10]. 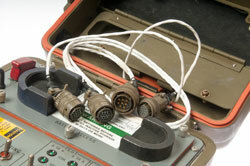 Unfortunately this is NOT a test set for any military telephone, but rather for testing the pulses in Group Multiplexer. TSQ-111 (FAS),Communications Nodal Control Element (CNCE) "..contains a mixture of analog, digital, and circuit routing equipment. It operates as the central point of a node. As the central point, the CNCE configures, monitors, controls, and manages user communications. 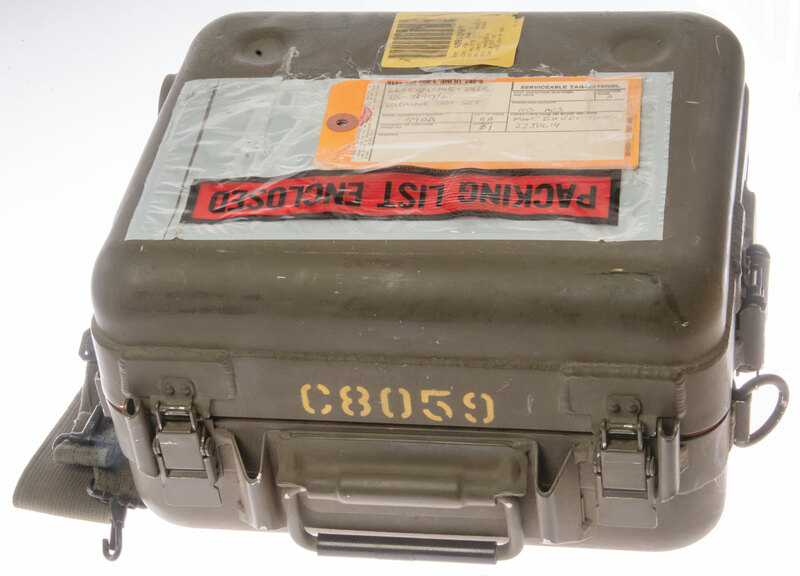 The CNCE provides communication links that pass teletype, data, and voice circuits to analog or digital transmission facilities. Secure devices are included to provide protection for circuits, trunks, and groups passing through the shelter for destinations inside and outside the node." TCC-42 (FAS) Automatic Telephone Central Office ".. is a sheltered automatic telephone switch which provides automatic switch and subscriber service for the TRI-TAC family or 4-wire analog and digital telephones including DSVT (secure telephone), DNVT (non-secure telephone), and analog telephones. The switch has six modems with 18 channel capability and one modem with 72 channel capability. The maximum number of single channel telephone subscribers is 100. The switch provides access to all other switches in the tactical network as well as commercial and Autovon circuits. TRC-170, TRC-173, TRC-174 Tropospheric Scatter Microwave Radio Terminal "These terminals provide secure digital trunking between major nodes of a TRI TAC communications network. 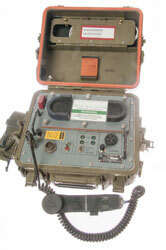 The multichannel radio terminal interface with other TRI TAC and current inventory equipment. TRC-170 terminals are also used in stand alone applications; that is, as a transmission link not associated with a technical control. TRC-170 links might carry dedicated traffic to include analog and digital channels, point to point subscriber circuits, facsimile circuits and teletype circuits." TD-1234 Remote Multiplexer Combiner [TM 11-5805-707-12, NSN: 5820-01-145-2458] 8.5" x 13" x 17.25"
TD-1233 Remote Loop Group Multiplexer [TM 5805-706-34, NSN: 5820-01-145-2462] 8.5" x 13" x 17.25"
s/n: 59AA Unit of Issue: Ea. Included is a standard H-250 handset. There are two cables stored under the door inside the lid. Each as an MS3126F14-18S connector labeled "P1(J4)" which connects to the ORDERWIRE jack on the front panel. This cable is made up using two cables and is terminated with a MS3126F16-8P Plug (8 male pins) marked: P2(J3). This cable is made up using only one cable and is terminated with a MS3126f12-10S (10 female sockets) marked: P2(J9.10).